ONE OF THE GOLDEN CLIPPERS. This low-wing Wibault 282 monoplane, named Le Glorieux, has three engines. Monoplanes of this type, seating ten passengers, were used between 1933 and 1938 on the ninety-minutes’ London-Paris service. In 1938 the Golden Clippers were replaced on this service by faster Marcel Bloch monoplanes, which reduced the journey time by fifteen minutes. THE great French, company Air France came into being on August 30, 1933, when five important lines were merged into a single organization in which the French Government held a large interest. The French decided that it was advantageous to concentrate within one company the air lines linking France with the world, thus following similar examples of Great Britain and Germany. Air Orient, Air Union, Aeropostale, C.I.D.N.A. (Compagnie Internationale de Navigation Aerienne) and Farman Air Lines were amalgamated. At the time of writing about 23,000 miles of routes are operated by Air France. The services of the company, in conjunction with Pan American Airways and the China Aviation Corporation, encircle the globe. The lines of Air France extend from London and Paris southeast to Hanoi and Saigon, in French Indo-China; south-west to north-west Africa, Brazil, Uruguay, Argentina and over the Andes to Santiago, the capital of Chile. Mail is carried from Natal, Brazil, by Pan American Airways to New York and across the United States to San Francisco by United Air Lines. From San Francisco Pan American flying boats carry mail to China, and machines of the China Aviation Corporation complete the circle to Hanoi. Air France serves the chief cities of Europe, either independently or in cooperation with other European companies. Its machines fly over four continents - Europe, Asia, Africa and South America - and over thirty-seven countries. The South Atlantic service enables letters posted in London before noon on Saturday to reach Chile in from four to five days, and has brought that remote country nearer in postal time than New York, which is only about one-third of the distance from London. During the Paris Exhibition of 1937 many philatelists posted letters at the post office to go round the world and return in about a month bearing the stamps and postmarks of the various countries. The routes of the widely extended system are divided into the following four divisions: those to the European capitals, those to the Mediterranean countries, those to West Africa and South America, and those to Indo-China. The five fleets taken over by Air France in 1933 totalled 259 aircraft, 226 being landplanes and thirty-three seaplanes or flying boats. Of the land-planes no fewer than 180 were single-engined aeroplanes, and the seaplanes and flying boats were single or twin-engined craft. A big task was involved in the replacement of this large and varied fleet along routes extending for about two-thirds of the circumference of the Earth. Air France could not solve its problems by adopting one type of aircraft, but had to evolve the types most suitable for each section. The flying boats form two fleets, those operating on the Mediterranean routes and those on the Atlantic service. The Mediterranean flying boats were designed for mail and passengers. The Atlantic fleet was built for the carriage of mail, although flying boats to carry passengers on this route were being built in 1938. Long sections of the routes in Asia and in Africa traverse tedious deserts and the landplanes are designed to provide the maximum comfort for passengers as well as ample space for mail. In South America the routes pass above dense forest, open pampas and the Andes. In Europe the machines link the chief capitals and provide speed, safety and the latest refinements of air travel. The growth of traffic has been continuous. In 1934 50,019 passengers were carried; this number increased to 60,719 in 1935, 66,670 in 1936, and to some 89,000 in 1937. The longest Air France route is from London to Santiago, a distance of 9,365 miles. The establishment of this service was one of the major achievements of civil aviation. The service was founded at Toulouse - the capital of the Department of Haute-Garonne - by veteran pilots of the French air arm and a group of business men. The first section of the present route was opened on Christmas Day, 1918, by the inauguration of a service between Toulouse and Barcelona, the Spanish port and commercial centre on the Mediterranean coast. This is one of the oldest regularly operated civil air routes in the world. The immediate aim was an air mail route to French Morocco and on to Senegal. An air mail route to South America was to be the eventual goal. The first flight to Morocco was made in March 1919, but the Spanish Government did not immediately give permission for certain towns in Spain to be used by French aircraft. September 1, 1919, saw the inauguration of the service to Casablanca, the busy port on the Atlantic coast of French Morocco. The mails were flown in relays - from Toulouse to Barcelona, from Barcelona to Alicante, in southeastern Spain, and from Alicante to Casablanca. Each machine carried two passengers and half a ton of mail. Later, the service from Toulouse ran via Barcelona, Alicante, Malaga (southern Spain) and Rabat (Morocco) to Casablanca, and other routes from Alicante to Oran, in Algeria, and to Fez and Casablanca were instituted. The regularity with which the mail aeroplanes were flown from Toulouse to Casablanca in the early days of civil aviation gained recognition outside France, and many foreign authorities regarded it as an example worthy of emulation by their own air services. Soon the difficulties became abnormal because of war between the Riff tribesmen and Spain. French mail pilots knew that a forced landing in the Riff country would mean ill-treatment before they were ransomed. By 1922 the service to Casablanca, formerly twice weekly, had become a daily service. Much had to be done before the route could be extended along the long, lonely coast from French Morocco through the Spanish territory of Rio de Oro, and along the coast of Senegal to Dakar. The air line reached Dakar in June 1922. Dakar, capital of the Federation of French West Africa, is a few miles from Cape Verde, the most westerly point of Africa. Across the Atlantic, some 2,300 miles to the southwest, is the Brazilian port of Natal, in the east of South America. In 1925 aviation was not sufficiently advanced to enable the French to concentrate immediately on the conquest of the ocean passage by air. Their project was to ferry mail across by fast vessels, and to fly it in South America. They negotiated with various South American Governments and received permission to survey an air mail route from Natal to Rio de Janeiro (capital of Brazil), Montevideo (capital of Uruguay) and Buenos Aires (capital of Argentina). THE EUROPEAN NETWORK of Air France services is centred in Paris. This map shows how various capital and other cities are connected; in addition, it indicates the beginnings of the great trunk routes to South America and to French Indo-China, which are outlined in another map on this page. On either side of the Atlantic the task of preparing the route was formidable. Aerodromes had to be established on sandy shores or rocky coasts, or cleared in virgin forests; weather and radio stations had to be built and maintained. On the South American coast the mail service between Natal, Rio de Janeiro, Montevideo and Buenos Aires was opened in March 1928. In July 1929 the mail route was carried westward from the Argentine capital to Mendoza, and across the Andes to Santiago. 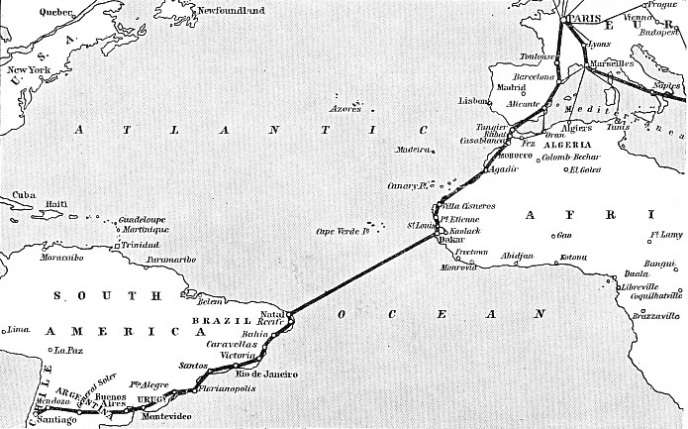 Fast packet ships were acquired to cross the ocean between Dakar and Natal in from four to four and a half days, to connect the two air routes on either side of the Atlantic. This system reduced to ten days the mail time between Europe and the South American cities. Later an alteration was made which accelerated the service. Air bases were built at the Cape Verde Islands, about 350 miles from Cape Verde, on the African coast, and also on the islet of Fernando de Noronha, 200 miles from the coast of South America. Flying boats from the Senegal capital, St. Louis, which lies north of Dakar, flew the mail to the ships at the Cape Verde Islands. Landplanes were loaded at Fernando de Noronha with the mail from the ships and flew to the Brazilian mainland. This reduced the total time to about seven days. Meanwhile, research and experiment combined to produce aircraft capable of operating the ocean route, although in the early stages it was doubtful whether it was worth while, as the system of aircraft and ships was proving efficient. This period - the beginning of the nineteen-thirties - revealed the ability, perseverance and enthusiasm for the all-air route of a pilot named Captain Jean Mermoz. Mermoz had been one of the pioneer pilots on both sides of the Atlantic. On the West African mail route he had fallen into the hands of the Riffs on two occasions and had been ransomed. On the South American route he had become noted for ability and endurance. When it was decided to make an experimental flight across the Atlantic Mermoz was selected as pilot. The aircraft was a Latecoare 28 flying boat, powered by one 600 horse-power Hispano-Suiza engine. With two companions, Dabry and Gimie, Mermoz flew from St. Louis, Senegal, to Natal, in May 1930. Later a return flight was made, but the machine descended about a hundred miles from the African coast, and Mermoz and his companions were taken off by a ship. Largely because of the enthusiasm of Mermoz for an all-air service, various manufacturers began experiments to produce a multi-engined aircraft capable of carrying mail across the South Atlantic with a reserve of power to ensure the maintenance of a schedule. Three years of design and construction followed. In January 1933 Mermoz made the flight with five companions in the Arc-en-Ciel. This was a Couzinet 70 monoplane powered by three 650 horsepower Hispano-Suiza 12Nb 12-cylinder water-cooled engines. After slight modifications the machine made the return flight in May, and later made a number of experimental crossings without mishap. In 1934, two flying boats made experimental flights. One, the Croix-du-Sud, a Latecosre 300, was piloted by Commander Bonnot. This machine was the prototype of a class. The four 650 horse-power Hispano-Suiza 12Nbr 12-cylinder V water-cooled engines are mounted in tandem pairs, one at either extremity of the centre section. The craft is a high-wing braced monoplane, with two lateral stabilizers on the sides of the hull. Span is 144 ft 11-in and length 84 ft 7-in. Loaded weight is 50,600 lb, the payload being 2,210 lb. Maximum speed is 130 miles an hour, ceiling is 15,100 feet, and range 2,980 miles. The other flying boat tested over the route in 1934 was the Santos-Dumont, a Bleriot 5190. The four engines are Hispano-Suizas of the same power and type as in the Croix-du-Sud. Span is 141 feet, length 85 ft 3-in and loaded weight 49,500 lb. Maximum speed is 136 miles an hour. Early in 1935, in preparation for a full-scale experimental service, the Centaure, a landplane, made the crossing. This Farman F220 monoplane has four Hispano-Suiza 600 horse-power engines mounted in tandem pairs. She has a crew of five and carries as much as a ton of mail. LOIRE-NIEUPORT 102 FLYING BOAT, designed for long-distance flights. This high-wing braced monoplane, named Bretagne (Brittany), has four 720 horse-power Hispano-Suiza 12Xbrs liquid-cooled engines, mounted in tandem pairs. The span is 111 ft 6-in, the length 75 ft 5-in, and the height 22 ft 9-in. Wing area is 1,525 square feet. Maximum speed at 9,840 feet is 192 and cruising speed at 13,120 feet is 155 miles an hour. The flights in 1935 were successful, and in January 1936 the all-air mail was inaugurated. Feeder routes from London, Amsterdam, Berlin, Scandinavia and Central Europe converge through Paris to Toulouse, where the mail is assembled. The all-air service cut the time down to five days. The Centaure proved fast and reliable and other machines were added. One, the Ville de Dakar, flew from Natal to Dakar in fourteen hours in 1937 at a speed of 137½ miles an hour. In November 1937 the chief pilot of Air France, Paul Codos, flew a four-engined Farman 223-1 - an improved Centaure - from Le Bourget, Paris, to Santiago, in fifty-eight hours forty-one minutes elapsed time or fifty-one hours forty-five minutes flying time. Codos made the flight to obtain experience of the entire route. He took off from Le Bourget, landed at Marseilles and, after stops at Dakar, Natal and Buenos Aires, finally landed at Santiago. His machine has four Hispano-Suiza 12 Xirs liquid-cooled moderately supercharged engines mounted in pairs in tandem, two engines driving tractor airscrews and two driving pusher propellers. Maximum power of each engine at 7,850 feet is 725 horse-power. Span is 110 ft 2-in, length 72 ft 2-in, cruising speed 175-185 and maximum speed 216 miles an hour, the range being 5,000 miles. The Air France machines seen at Croydon are fast and luxurious. On March 27, 1938, the Marcel Bloch 220s were put on the London-Paris service to reduce the Croydon-Le Bourget time to seventy-five minutes. The Marcel Bloch liners are all-metal, low-wing cantilever monoplanes powered by two Gnome-Rhone 14 supercharged 890 horse-power engines. The maximum speed is 212½ miles an hour; the cruising speed at 60 per cent throttle is 200 miles an hour. The machines have three-bladed variable pitch propellers, retractable undercarriages, automatic pilots and complete de-icing equipment. Sixteen passengers and a crew of three are carried. The range is 620 miles - almost three times the length of the London-Paris route. The all-up weight is 20,140 lb. As these aircraft are low-wing machines the sunshine comes into the cabin unobscured by an upper wing, and the cabin floor is high in the fuselage, so that each passenger has a clear forward view, each chair being against a window. Before the machines were put on the routes between Paris, London, Scandinavia and Central Europe they were flown between Paris and Marseilles throughout the winter to accustom the pilots to the machines during the most difficult weather. Only slight modifications were required and the type became popular with the pilots. A type which is used on the long-distance routes is the Dewoitine 338 all-metal low-wing monoplane. It seats twenty-two passengers and is the passenger model of the 333 mail-carrying machine. The mail type was flown for a year on the Toulouse-Dakar route. A machine was taken down after 1,000 hours of flying on this service; no replacements were needed. The three engines are 650 horse-power Hispano-Suizas. The 338s enabled Air France to operate the five-days Far East passenger and mail service. In January 1931 Air Orient began a fortnightly service, taking ten days from Marseilles; the time was reduced to eight days in the following year. After the formation of Air France in 1933 the service was expanded and the time reduced first to seven, then to six, and ultimately to five days. The 338s on the Orient route replaced Potez 62 twin-engined monoplanes powered by two Gnome-Rhone 14 Kirs engines. These machines are fast and accommodate fourteen passengers, and it was decided to use them until the roomier Dewoitine 338 machines were available. The Dewoitines afford more comfort on the route, much of which is over deserts and entails flying for ten hours a day on some of the stretches. TWO GREAT TRUNK LINES are operated by Air France. One line, trending south-west, links Paris with South America; the other, or south-eastern line, provides direct air communication between Paris and French Indo-China. The south-western route is normally by way of Toulouse or Marseilles, Barcelona and Alicante to Tangier, Morocco. Thence the west coast of Africa is followed as far as Dakar. The South Atlantic Ocean is crossed between Dakar and Natal, Brazil. From Natal the route is via Rio de Janeiro, Brazil, and Montevideo, Uruguay, to Buenos Aires, Argentina. The aircraft cross Argentina to Mendoza,whence they fly over the Andes to Santiago, Chile. Aircraft on the south-eastern route fly from Marseilles, via Naples and Athens to Tripoli, Syria. Motor cars take passengers from Tripoli to Damascus. 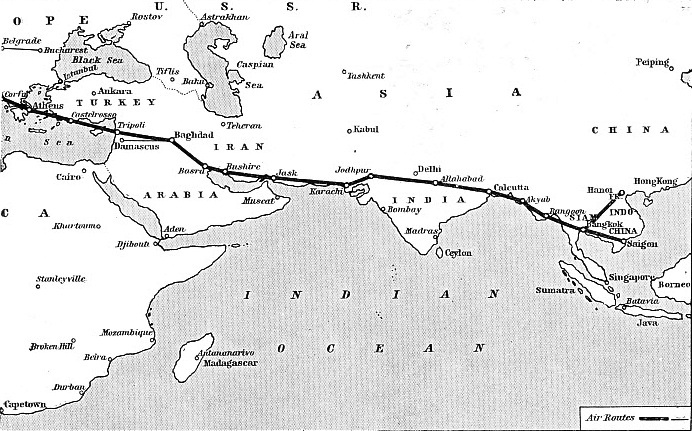 Thence the route is via Baghdad and Basra, Iraq, Bushire, on the Persian Gulf, and Jask, Persia, to Karachi. British India is crossed between Karachi and Calcutta. Through Burma the aeroplanes fly to Bangkok, capital of Siam, where the route forks. One branch goes north-east to Hanoi, capital of Tongking; the other south-east to Saigon, capital of French Cochin China. The following details of services are those in operation in the spring of 1938. and are subject to modification. The service is a weekly one from and to Marseilles. Passengers from Croydon, London, leave on the Wednesday morning and are flown to Paris. Berths are provided on the evening train, which reaches Marseilles early on the Thursday, when the passengers are taken to the airport to embark in the flying boat. The flying boat flies 535 miles across the Mediterranean to Naples, the next stage being 425 miles to Corfu, and the third 275 miles to Athens, 1,925 miles from London. The night is spent at Athens. On the Friday the flying boat’s first stage is 385 miles to Castelrosso, an island port off Asia Minor; its second stage is 415 miles to Tripoli, in Syria. Motor cars take passengers from Tripoli through Beirut to Damascus. There they embark in the Dewoitine, which flies them to Baghdad, 3,250 miles from London, for the night’s rest. Saturday’s three flights are 575 miles to Bushire, on the Persian Gulf, then 485, miles to Jask, Persia, and finally 730 miles to the Indian port of Karachi, 5,040 miles from London. On the Sunday the Dewoitine flies to Jodhpur (434 miles), Allahabad (596 miles), and on to Calcutta, this stage bringing the total distance from London to 6,540 miles. Monday’s three flights are to Akyab (Burma), 360 miles, Rangoon, 485 miles, and Bangkok (Siam), 465 miles. At Bangkok, 7,850 miles from London, the route forks. On the Tuesday one machine flies north-east for 550 miles to Hanoi, the capital of Tongking. 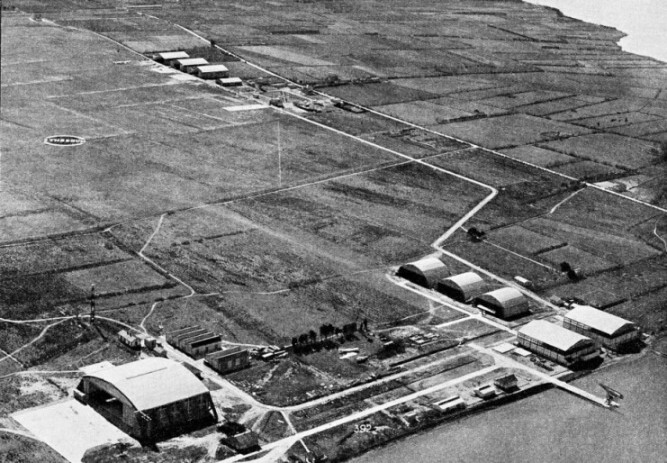 At Hanoi connexion is made, 8,400 miles from London, with the China Aviation Corporation service to Canton, where the link is made with the Pan American flying boats. The other line from Bangkok goes south-east to Saigon, capital of French Cochin China and 8,700 miles from London. The fare is £150 single from London to Hanoi or Saigon, and the return fare £270, return tickets being available for one year. The fares include meals and hotel accommodation at the overnight stops. Passengers are allowed 20 kilograms (44 lb.) of luggage free; luggage up to another 20 kilograms is charged at half the full rate, which is 15s. a kilogram for the entire distance. On the West African route there are several passenger services a week from Paris, Toulouse or Marseilles, these being linked with London. The Air France line goes via Casablanca, and Agadir, in Morocco, Villa Cisneros, in Rio de Oro, and St. Louis to Dakar, this route being on the mail line to South America. Single fare from London to Dakar is £56 8s. From Dakar the coast route is continued by machines of the Aeromaritime Company, which fly passengers along the coast of the Gulf of Guinea to the French Congo. flying boat for Tunis leaves Marseilles at 11.30 a.m. and flies to Ajaccio, Corsica, where a halt of thirty minutes is made, and the passenger arrives at Tunis at 6.20 p.m.
Toulouse and Marseilles are the airports for the service which goes to Oran, and thence inland to Fez and across Morocco to Casablanca. Except on Thursdays and Sundays, when a machine leaves Le Bourget early in the morning for Toulouse, the daily service from Toulouse connects with the night train from Paris. Except on Mondays there is a service from Marseilles. The normal route is via Barcelona, Valencia and across the sea to Oran, Fez and Casablanca, some machines flying direct from Barcelona. At Casablanca connexion is made with the Aero Portuguesa service to Tangier and Lisbon. These air routes have accelerated travel between London and North Africa greatly, as transhipments are avoided. Services by ship to West African ports are relatively slow, and the air route has speeded up mail and passenger times. The flying boats of the Mediterranean fleet include the Breguet Saigon, powered by three 785 horse-power Hispano-Suiza 12Ybr engines. The loaded weight is 33,050 lb, the maximum speed 146 and the cruising speed 124 miles an hour. Nineteen passengers are carried. The European services are numerous. The Golden Clippers which, before their replacement by the Marcel Bloch machines, maintained a ninety-minutes Croydon-Le Bourget schedule, are used on a summer route between Croydon and Le Touquet, the Channel resort south of Boulogne. Flying time is fifty minutes. The Golden Clippers are three-engined Wibault 282 low-wing monoplanes. The schedules of Air France for the summer of 1938 provide five services from London to Paris on weekdays and three on Sundays, and the same number in the reverse direction. These services are operated by Marcel Bloch aircraft. Passengers leave Park Lane, London, an hour before the machine is due to leave Croydon and are taken by road to the airport. One hour and a quarter later they arrive at Le Bourget, whence they are taken by road in thirty-five minutes to the Place Lafayette, Paris. The elapsed time from the centre of London to the centre of Paris is two hours fifty minutes. Times in the reverse direction are the same. European capitals are served by arrangement with other air lines. Air France machines fly from Paris via Strasbourg to Prague, for Warsaw and for Vienna, Belgrade and Bucharest. Flying time from Croydon to Prague is five hours thirty minutes. A service from Le Bourget to Brussels takes seventy minutes, to Rotterdam two hours twenty-five minutes, and to Amsterdam two hours fifty-five minutes. A direct service to Amsterdam is flown in two hours fifteen minutes. One route to Germany is via Cologne in one hour fifty minutes, and to Berlin in four hours thirty minutes. Another is via Frankfurt to Berlin in four hours twenty-five minutes. By March 1938 the pilots on the South Atlantic route had made 271 ocean crossings - 137 from Africa to Brazil and 134 in the reverse direction. The experience gained is being used for the establishment of an air route between Paris and New York. MARSEILLES AIRPORT is the most important in the south of France. It lies on the coast, on the trunk line between Paris and the Far East; it is also a junction for numerous other services of Air France. One of these crosses the Gulf of Lions to Barcelona, for Alicante, in southern Spain, Oran, in Algeria and Fez and Casablanca, in Morocco. Another crosses the Mediterranean to Algiers, and a third goes via Ajaccio, capital of Corsica, to Tunis. Marseilles is also the last stopping place on the service between Paris and Cannes, on the French Riviera. You can read more on “Across the Pacific”, “Air Travel to the Continent” and “Belgium’s National Air Line” on this website.